Founded in 1968, the Lawyers’ Committee for Civil Rights of the San Francisco Bay Area (LCCR) advances, protects and promotes the legal rights of communities of color, low-income people, immigrants and refugees in California. Our Asylum Program, now in its 36th year, has represented thousands of refugees. We are currently litigating against inhumane conditions on the U.S.-Mexico border. We work to end the criminalization of poverty, including the over-policing of communities of color and unconstitutional seizure of property from unhoused people. Last fall, we won repeal of an unconstitutional loitering ordinance that disproportionately harmed Oakland’s Black public housing residents. Our Legal Services for Entrepreneurs Program provides transactional legal assistance to start-ups and small businesses at risk of displacement in low-income communities of color. We seek to change legal and business landscapes through policy interventions and establishment of alternative business models including public banks, commercial land trusts, and small-business purchasing cooperatives. We have constant need for pro bono attorneys, volunteer interpreters, and volunteers willing to help with data entry and administrative support. Please join us today! 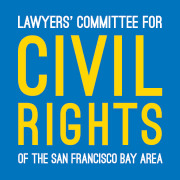 Would you recommend Lawyers' Committee for Civil Rights of the San Francisco Bay Area?